Many a man believes Megan Fox is an angel. Not necessarily one that resides in heaven with a halo over its head, mind you, but more in the you’re in my sexual fantasies kind of way. In Passion Play, Mitch Glazer’s directorial debut, Mrs. Fox combines both elements — she pouts and purses her lips like only she knows how (literally, it is how she conveys every emotion) and with a pair of CGI wings, she is seen as the savior to several lost souls. Down on his luck trumpeter Nate (Mickey Rourke), finds Lily the “Bird Woman” behind a glass partition at a travelling freak show after his execution goes awry. Was it fate that brought him there to see her? Can she be his salvation from a life of drugs and an untimely death at the hands of nefarious gangster Happy Shannon (Bill Murray), whose now dead wife he bedded? Can he save Lily from exploitation and deliver to her a dream of an idyllic life? For that to happen Nate first has to squirrel her away from the grip of Sam (Rhys Ifans), her “employer,” who isn’t so keen on her leaving his show. There are a few other wrinkles to Passion Play but overall they all converge back to the notion that everyone in the movie is looking for some form of redemption and to get it everyone is willing to do unscrupulous things. Nate, while seemingly in love with her, is willing to trade her off for his life, Happy wants her to somehow make him an honest man (even though he continues to have people killed at his whim), etc. It is all heavy handed — no nuance whatsoever — so much so that it is agonizingly painful to watch the actors wade through the symbolic sap. But their characterizations aren’t a boon to the script either. 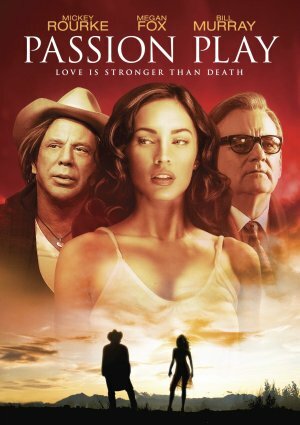 Mickey Rourke is the correct dramatic actor to cast as a washed up has been (he was nominated for an Academy Award for a similar role in “The Wrestler“). Somewhere along the line of his doing whatever in hell he is doing to his physical self, however, he now apparently can’t emote with facial expressions and most every word he speaks is a mumbled mess. Megan Fox doesn’t have to do much else but look pretty (which she does even with poorly rendered CGI wings), but she once again purses her lips and squints her eyes to prove to the audience she is a honest-to-goodness actress. I’m guessing here, but I think most of the time she was trying to show us Lily was sad. Or maybe happy. Or maybe horny. Bill Murray, having a good time as the bad guy, is the only passable thespian in Passion Play. And maybe the bearded lady too, cos you know she’s got a beard and it takes skill to be a female and pull off thick facial hair. The art school quality camera work and editing is so bad, that I won’t bother picking them apart. Overall, Passion Play delivers a terrible movie going experience. Avoid like the plague, lest the dirt from the worst movie of 2011 pollutes your thoughts as it has mine. The worst film I’ve seen this year, by far. Top review.